Diary of a Ledger: Three weeks and not a clue what I'm wearing. Three weeks and not a clue what I'm wearing. In a little under three weeks I will be attending Bestival and I haven't got a stitch to wear. Obviously I have some suitably indie garb for the Friday and Sunday but Saturday is fancy dress day. The theme is 'space'. I am not good with paper mache so the planned giant R2D2 costume is a no go. So dear readers what the hell am I gonna go as? I need something cheap yet visually brilliant, am I asking too much? I'm attending with a small group, one of whom is my sister so we can consider a theme. A cheap, simple theme, that will not break the bank. As per, you can forward ideas to me on twitter (don't worry about the current lock down, if you follow me I'll follow back), on the facebook page, on my actual facebook page and by email. If you are hugely creative and want to make me something I will shower you with praise on the blog and make you very well know (to about 40 people....). 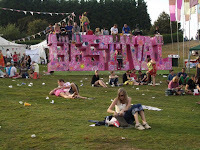 Bestival is such a great Festival but I do have weird memories. My first one was an absolute cracker. First flush of a new relationship, good friends and good times. I can barely remember who played it was just a lovely three days. A year later that relationship had just crumbled and I made a bit of a fool of myself. 'A bit of a fool of myself,' understates quite how bad it was... it was bad. How I got up on the Saturday morning is still something of a mystery to all who attended. Last year I took a skip year and avoided three days of rain and the Isle of Wight's premier country park (Robin Hill - Bestivals location, fact fans) turning into a giant mud wrestling extravaganza. So this year I'm dipping my foot back into the water with something amounting to trepidation. I aim to not get quite so drunk (I probably will get reasonably close) but most of all I am looking forward to watching Florence and the Machine who's album has been a bit of a soundtrack to my summer. It's actually going to be a bit odd going to a Festival without my hedonistic head on but weirdly I'm looking forward to that. Am I growing up? Hell no. Well maybe a lil bit. Shhh though ok? So anyway, as is my want with the blog, I've gone off on a ramble again, but I do want/need some suggestions. Thanks in advance.